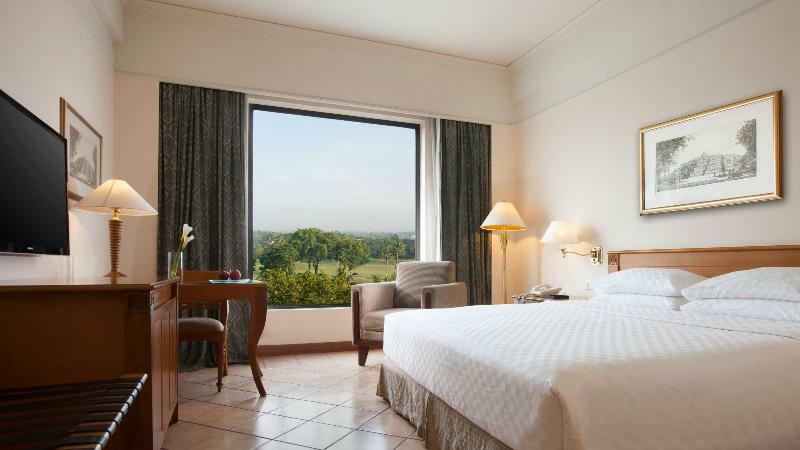 Have a question for Hyatt Regency Yogyakarta Hotel? 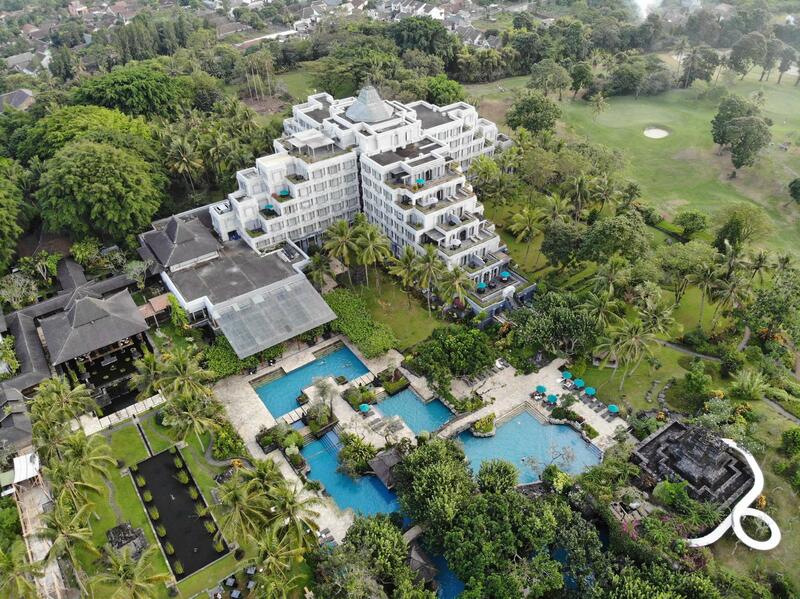 Situated on the scenic outskirts of Yogyakarta, the Hyatt Regency Yogyakarta Hotel offers a unique experience while touring Java. Sitting within 22 hectares of lush, green landscape while boasting Javanese decorum together with contemporary accommodations, this property gives the impression that one is away from it all. In addition to on-site luxury, guests may enjoy breathtaking views of Mount Merapi, Seribu Mountain, as well as Java’s natural landscape. As if the design wasn’t enough, there is even a nine-hole golf course, swimming pool, tennis courts, spa, and fitness center within the premises. 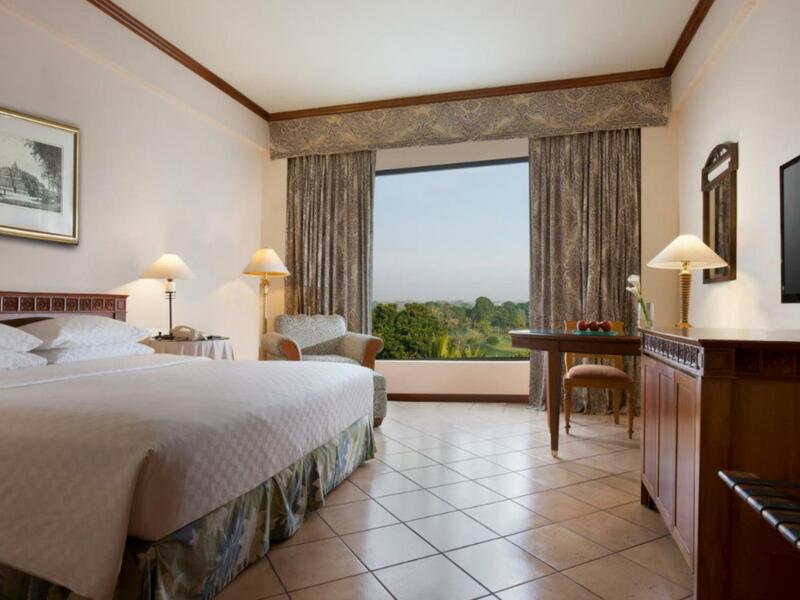 Hyatt Regency Yogyakarta Hotel is conveniently located near the main highway with easy access to Borobudur Temple, 15 minutes from Adisuciptio Airport, and approximately a 10-minute drive to the city center. Early check-in from 11:00 AM to 2:00 PM is subject to an additional charge. Early check-in from 6:00 AM to 11:00 AM is subject to an additional charge of 50 % of a standard room's rate. Early check-in before 6:00 AM is subject to an additional charge of one night. Please contact the property directly for more details. - Check in time before 06:00 am will be charged 1-night stay - Check-in time starts at 06:00 am - 11:00 am will be charged 50% of the hotel room rates that applied on the check-in time period. - Check-in time starts at 11:00 am - 01:59 pm will be charged IDR 300.000 net/room and it will be based on the availability of the room upon check-in. I love this hotel, great environment, good for rest and relaxation, especially when the hotel building is away from hustle and bustle of the city. Very friendly staff, have a good attention to detail. This is an old hotel that has good amenities, a fair balance considering the price. What stands out is the level of service the staff provide. Seems like giving the best service they can is engrained to their core. Everything in Hyatt Regency is just perfect. The overall design is a harmonious blend of traditional and modern. The beautiful pond, multiple swimming pools, golf course, gardens, were all I need to have a true relaxing holiday. I could fall asleep anywhere because it’s just so beautiful and serene. The staff were friendly and professional. They have taken all my requests seriously and with great efficiency. Besides, I love the double tier security feature - one at the main entrance and one before entering lobby. With recent attacks in Java, these days you couldn’t be too careful. As a solo female traveler I feel safe and at ease here. Definitely a hotel I want to visit whenever I need to unwind, to find peace within body, soul and mind. We had been stay for 3 night . It is perfect , This hotel enviroment made us closed with nature and really great view . It is not first time we had been stay here that hotel made us want back there definetely we will back again . We enjoyed our stay here in Hyatt Regency. We were lucky to get a free upgrade to the garden terrace. Location is quiet and peaceful from the hustle and bustle of the Jogja town. The sceneries around the hotel and outside our room were superb! Too bad i only had 1 day for jogja trip and didnt have time to play golf neither bring my kids. It could have been awesome if i had the chances. However staying at hyatt was the right decision. It still one of the best and historic hotel, great facilities, lovely architecture and relatively closer to merapi lava tour and jejamuran restaurant. Two places i visited during my trip. Staff were very polite and act on your request immediately. They always have a smile for you at all times including wee hours of the morning. They will prepare your breakfast box if you are going for sunrise trip. Awesome service. im stayed here for 2 days, this hotel give the best service. very recommend hotel with the facility. 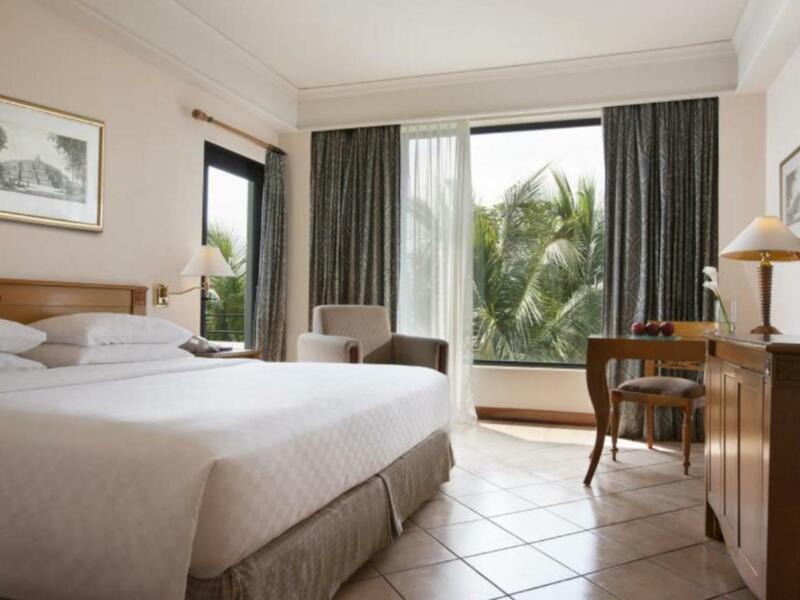 Found a good last minute deal on Agoda for a double bedroom at ~IDR 900.000. I must say the room was average (not very large, a bit old, no shower just a bathtub, a bit noisy) but the hotel facilities and the breakfast made the whole stay a great value for money. The swimming pool in particular is amazing! Gardens not only beautiful but huge and stock with so many different plants. The place is well maintained. The sight of the greenery is so uplifting after a tiring tour. Rooms a bit old fashioned but that's ok with me. Not small but clean and everything you need is there. The staff is super courteous and helpful Breakfast offers a huge selection I am glad it's situated far from the city. It's good to away from the din of the traffic. 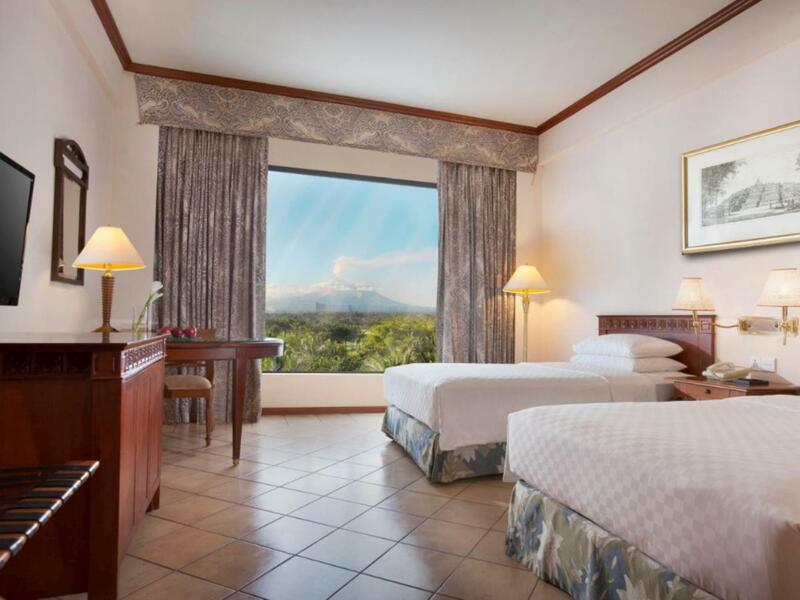 My room had a fantastic view of 2 volcanoes! Pros: we don’t need to go out for short weekend getaway. They have everything for kids, put put golf, cycling, delman around nearby village, camping on their ground, fishing . My kids really love the tree house and comfort swinging bench where we can just lying lazily reading books. We book club room and afternoon tea at the club taste delicious with variety of foods Cons: they should have renovated the rooms with big brand like hyatt the rooms are all dated. And as suggestion they should sometimes fog the garden, many mosquitoes around. It is a very nice hotel to come back to after a long day outdoors. The breakfast is superb. Staff are very accommodating and friendly, esp. Sri who remembered us by names and took the extra effort in ensuring that there will be a takeaway breakfast pack for us since our flight out of Jogja was very early morning. On the other hand, the housekeeping need to take care a little more on details. Our bathroom handle was broken when we checked in but throughout our stay, nothing was done. It seems like a previous guest has used it as leverage when climbing out of the bathtub and broke it. Otherwise, it is a truly wonderful hotel and stay we had. Thank you! I stayed at the Hyatt Regency Yogyakarta for 3 nights. I have a mixed review here, though overall any complaints will probably just be nitpicking. To start, the property is spectacular and stunning. Every detail is amazing. The golf course is beautiful, the pool is beautiful and the facilities are beautiful. No complaints on the outside. Let’s go to the room. Mine was of adequate size. I didn’t have much of a view, but I also had their standard room. The shower, to me, was a bit small. I am about 6’1”, 230 lbs, and I felt really cramped in the shower. That would be my only complaint. The staff. Excellent. Attentive. Friendly. Zero complaints. Fitness center. Well…. Really no such thing. They have a “gym” that is actually the size of my room itself. There is a couple of tread mills, an elliptical, and a few machines (lat pulldown, leg curl, bench press). Then there is a small area with free weights, but no bench. And I mean small. MAYBE 4 feet by 4 feet. This hotel is MASSIVE. The fact they don’t have a better, more state of the art, fitness center is kind of disappointing. And kind of confusing. They have plenty of room here to make something much better. Food. I only ate the buffet breakfast. If you don’t sign up for it you are crazy. It is 100,000 Rupiah which as of today is about $7.42. It is all you can eat and drink, and the food is excellent. Make sure you do this. Transportation. I ended up getting a driver named Agus. He was EXCELLENT. The charge is 110,000 Rupiah, or about $8.16 USD per hour. Agus took me out each night to places I selected through my research, and also took me to the temples of Borobudur and Prambanan (which are well worth it, and I have reviewed them here). He also was my transportation back and forth to the airport. Well worth it. Pool. Beautiful. They also have poolside food and beverages. Excellent. All in all a great stay, with just a few minor issues. The Agoda rate include breakfast so I didn't eat there. Everyone was smilin and polite except for one cashier staff. The swiming pool was small but good enough for a swim and only three people were using. A little far away from city but there was a shuttle service until 9 pm. The Hyatt Yogya is one of our favorite places! Our children love the waterslide and pools and we all love the breakfast buffet. The grounds are beautiful and the staff are excellent at what they do.